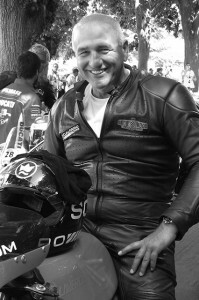 It was with great sadness that we learned of Karl-Heinz Kalbfell’s untimely death following a tragic accident at Brands Hatch during the Lansdowne Classic Bike Racing Series on August 17th, 2013. He was only 63. Karl-Heinz Kalbfell was a unique character and of great personal importance to us as a mentor, advisor and partner. He was instrumental in establishing Scalfaro in the classic motorsport world, also as leader of the Scalfaro Classic Racing Team. We are deeply thankful for his advice and guidance. Karl-Heinz Kalbfell was one of the motor industry’s most respected and experienced personalities. His achievements include leading positions with BMW where he played a key role in the success of the “M” Motorsport Division, but also in the development of the BMW V12 engine that powered the McLaren F1 as well as the establishment of the new Rolls-Royce factory on the grounds of Goodwood. After leaving BMW he joined Alfa Romeo and Maserati as CEO before becoming an advisor to several key companies in the automotive industry. He was an amazing character with a true passion for motorsport. We shall greatly miss his advice, presence and good company and will always remember him with gratitude, appreciation and great respect for the personality he was. Our thoughts are with his family to whom we express our heartfelt sympathy and condolences.